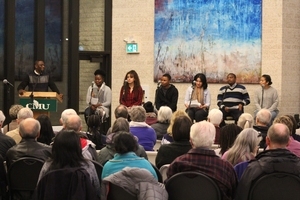 CMU hosted a conversation featuring seven immigrants to Canada as part of its Face2Face conversation event titled, "Whose Neighbour Am I? Newcomers in Canada". Compassion and patience are key when relating to newcomers. That was one of the main messages at a Face2Face community discussion at Canadian Mennonite University (CMU) on November 7. "Be open-minded about newcomers," said panellist Daniella Mirimba, who came to Canada from Congo in 2013, when she was 15 years old. "If you see that someone is struggling with languages... be patient with them and just try to understand where they're coming from." Titled, "Whose Neighbour Am I? Newcomers in Canada," the discussion highlighted newcomers' experiences, and explored how Canadians might be better neighbours to them. Panellists discussed the significant challenges they encountered coming to Canada. For Mirimba, who grew up speaking French and Swahili, learning English was the biggest difficulty. "Without knowing the language, it's hard to connect with other people and feel at home," she said. Reem Younes said that after studying in university for eight years in Syria, it was difficult having to restart her education when she settled in Winnipeg. Arisnell Mesidor, an immigrant to Canada himself, moderated the evening's conversation. She added that being separated from her family was challenging. "I left... the place I was born, (my) family, sisters, brothers, parents," said Younes, who came to Canada in 2015 at the age of 30. "Still now, it's difficult, but you have to integrate. You have to adapt." Jamileh Naso, who arrived in Canada with her family in 1999 at the age of three, spoke of the "head-butting" that happened in her family as a result of her becoming accustomed to Canadian culture faster than her parents. "By third grade, I was just like every other Canadian child, but my parents on the other hand... always had fears and always were asking me questions," said Naso, who is originally from Iraq. "I didn't know how to balance the two cultures and (tell them), 'This is how they do it in Canada.'" "People from Canadian culture don't understand those fears that the (newcomer) parents have," Naso added. "It creates a bit of a rift between the parent and child." Panellists went on to discuss additional supports that would have helped them when they arrived. Anie Sanchez, who came to Canada from Colombia in 2002 when she was 17, said that "psychological help would have been very helpful for me and my family" in their time of transition. Newcomers may need help processing the things they experienced prior to arriving in Canada, Sanchez said. "People on the outside look great, but you don't know how they've experienced a lot of terrible things," she said. "That also affects learning the language and your development here, and how you cope with the new culture." Later, Sanchez choked up as she recalled the day she arrived in Canada, and how it immediately felt like home. "I remember arriving at the airport and at that moment, I felt safe," she said. "I think that is the definition of home: (a place) where you feel safe." Toward the end of the discussion, Terry Schellenberg, Vice President External at CMU, thanked the panellists. "Your stories have touched us," he said. "Your vulnerability (and) your honesty has spoken to us in very important ways, and we leave tonight, I think, with better insights about who it is we are and the kind of neighbours we're invited to be." Find information about upcoming Face2Face discusions at cmu.ca/face2face and watch a recording of the November 7 event below.